If you’ve ever uploaded a video to YouTube you might be aware of their Content ID system. Basically whenever a video is uploaded, it scans the content and tries to match anything within it against its huge database of known music and video content. So if your video includes (for example) a Michael Jackson song, you’ll likely find yourself with a Content ID claim from Sony Music Entertainment (SME) on your video. And to be honest, this is absolutely fair enough – they do own the rights to the music so if anyone is going to earn advertising from that music, it should be the rights holders. It’s a pretty clever system and it actually works fairly well, most of the time. If the song has distinctive vocals, melody, drums etc. then it will probably correctly identify any music used in the video. But what happens when it makes a mistake? For example, it doesn’t always work so well on more atmospheric music with no drums or vocals – like ambient or instrumental music! Or maybe you used a loop from Garageband or a commercially available sample collection that other people have also used. In these instances, it’s not unknown for the system to incorrectly match a similar sounding track against a completely different track. These false positives maybe share the same chord progression or musical key but without a vocal to latch onto, the system sometimes wrongly matches similar sounding instrumental tracks. In my experience, these initial disputes are often just blindly ignored by the claimant (or possibly even automated) who will commonly just click ‘Reject’ against your claim without even checking whether what you say is true, in the hope you’ll just go away and leave them to earn a few pennies off your video. At this point you have one last chance to file a counterclaim (though many people stop there, particularly if they are using material without permission and don’t want to get into legal trouble or risk a copyright strike on their account). It seems that it’s only at this point that the claimant might actually begin to take a look at your video to see if what you say is true, if only because they can at this point, also be held legally accountable for their decision. If you are genuinely using copyright material without permission (which you shouldn’t…) the claimant will probably stand their ground (as you would expect…) and either pull the video or mute any music they own the rights to. I don’t actually know what usually happens here because I’ve never used other people’s music in my videos! But I have had false/incorrect Content ID claims put on my own music! 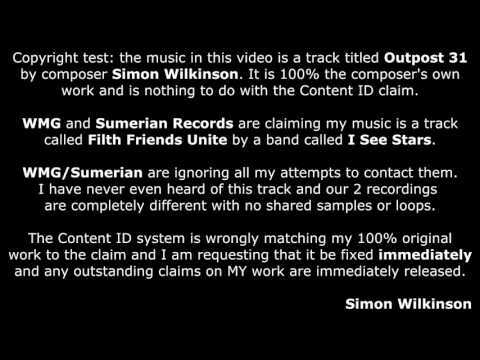 Currently if you include my 100% original music track Outpost 31 in a YouTube video, you will automatically get a claim from WMG (on behalf of Sumerian Records) saying that you are using a track called ‘Filth Friends Unite‘ by a band called I See Stars. 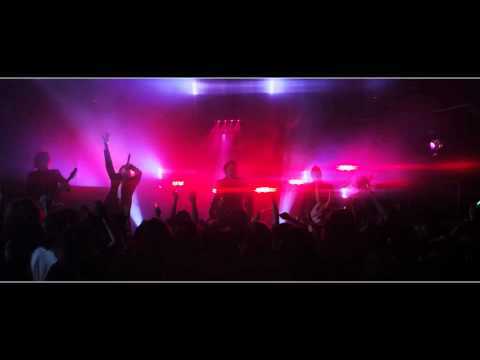 I had never even heard of this track or band until I got a claim on my own video so I looked them up to see if there were any confusing similarities. As you can hear, theirs is a kind of thrashy pop-punk, metalcore song with vocals and guitars (song starts about 45 seconds in) whereas mine is a slow, downtempo, orchestral, electronic instrumental. The 2 tracks are completely different: different tempos, different musical keys and don’t share any samples, dialogue, loops or anything else that could be remotely confused. So I can only assume there is some kind of glitch or error in the Content ID database or metatags that is causing it to wrongly match two completely unrelated tracks. Yet every time I try uploading a test video containing my song, I get an automatic Content ID claim. So I file a dispute, which I would expect them to look at and realise there’s been a mistake and release my video. But instead they just sit it out and leave the claim to expire after 30 days, presumably because they know they have no case (or more likely because up until now, they receive any advertising revenue generated by your video during that crucial 30 day period when you’ll probably get the most hits on your video – see update at the end of this post). The reason I’ve uploaded my test video above with my music on is to highlight the problem – I’m not trying to get this particular video released from the claim (that always happens anyway after 30 days when the claim expires and if they want to uphold it and take it further legally I’m happy to do so – I will definitely win!) I just want to get whatever the problem is, fixed, so that my clients don’t also receive false/incorrect claims on their videos. But they’re putting blanket claims on any video that uses this particular track so if you want to license Outpost 31 and use it on YouTube (or if you have licensed it and got a Content ID claim) please contact me and I’ll explain the process of how to successfully file a dispute if you get one. I can guarantee that Outpost 31 is 100% my own work – my track was written and released several years before theirs and I have all original multitrack recordings to prove I created it with no samples (not that there’s even a similarity to dispute!) I’m sure it’s a genuine mistake but they have no right to put claims on my work. I’ve tried contacting both WMG and Sumerian Records numerous times via email, on their Twitter accounts, Facebook pages etc. to politely ask for help but they refuse to acknowledge any kind of response. I’m sure it must be some kind of technical error within the Content ID system but for some reason no-one at WMG or Sumerian Records is willing to talk to me. And this highlights one of the worst things about Content ID. YouTube have no interest in looking into genuine false claims or monitoring the way claimants are abusing the claims process; they just want to appease the record labels and minimise the admin involved (hence there’s no way to contact YouTube and ask for help). I know this kind of thing also happens a lot to other people but YouTube won’t get involved. Just search Google and you’ll find thousands of genuine Content ID problems and similar issues that are continually ignored. When Content ID works correctly it’s a pretty workable solution to help copyright holders rightfully monitor and administer their work, but when it doesn’t work it’s an extremely frustrating and poorly implemented procedure with no real right-to-reply that always works in favour of the big companies. Update: The one good thing which YouTube have just announced is that instead of diverting any advertising revenue to the claimant for the 30 day period (while the claim is supposedly ‘investigated’) they will now hold the revenue and make sure the winning party in the dispute receives any advertising earnings if and when the dispute is finally settled. But the system still makes it incredibly frustrating to try and resolve when things go wrong (as I mention here in a brief interview with CBC). YouTube should provide some kind of mediation to help resolve technical problems and wrong IDs within their Content ID system. If you receive any Content ID warnings using my genuinely licensed music on YouTube, please contact me and I’ll help you to try and resolve it (there are certain steps to take during disputes which can make it easier). I absolutely own 100% of all my copyrights and I don’t sample anyone else’s work, so no-one should be making any false claims on my work! A fascinating book that looks into the science of how we’re emotionally affected by music. The author is an experienced sound engineer, music and neuroscientist and brings his experience to rationalise and explain some of the mechanics of why we love to hear certain songs. Excellent reading for anyone with a love of music. Learn to: score videogames, develop music for different characters, address the standard types of scenes and cues and formats required by game publishers; develop music for web sites, use sound technologies with mobile devices to create ringtones and other sounds; create demos and portfolios for getting clients. Learn everything you need to know to make jingles and score video productions with this new, updated second edition of this popular book. Prepare and present your demo recordings, work with clients, craft profit-producing copy, promote your work, protect yourself legally, get the money you deserve and more. Tips and advice on getting your music placed in film soundtracks and on TV shows from independent musician and composer Richard Jay. A detailed look at how musicians, songwriters, publishers, and indie labels—producing every kind of music—can earn good money from placing their music into film and TV in the United States and beyond. A collection of in-depth conversations with contemporary film composers of every style, background, and position in Hollywood’s hierarchy, offering a cross-section of current thoughts about the process of film composing, styles of film music, and working within today’s entertainment industry. Great interviews from film composers including Thomas Newman, James Newton Howard, Howard Shore, John Barry and many more. With the advent of MIDI sequencers, high quality sample libraries and low-cost recording gear, just about any composer anywhere can score a film. Well-known composer Sonny Kompanek teaches this new film scoring process at the prestigious New York University and now he shares his secrets with the pages of From Score to Screen. An essential book for anyone working with MIDI orchestration. With detailed methods of scoring for all sections from strings through to percussion. Aimed directly at users of libraries such as East West/GPO/Vienna and other major packages but also wide enough to cover all approaches to orchestral MIDI arrangement. Essential for beginners through to pros. I’ve found this to be a useful guide for any composer interested in learning the standard requirements for scoring to picture, eg basic film history, spotting, preparation etc (although quite US-centric). Also includes interviews with composers Danny Elfman, Elliot Goldenthal, Mark Isham, Alan Silvestri and many more. Originally written in 1913, the book focuses on traditional approaches to writing for orchestra. Although not perhaps as relevant to more contemporary approaches to scoring, there is a huge amount of useful information on the different orchestral sections and is an extremely useful text for film scorers. Offers a wealth of material for music students to create a full orchestral score by choosing the appropriate instruments, instrumental combinations and instrumental techniques.